A video converter now seems to be more and more important than DVD rippers as there are more and more videos to convert, merge, edit as well as downloading YouTube videos, making photo slideshows. Wondershare‘s Video Converter Ultimate is among the top video converters that work really great. 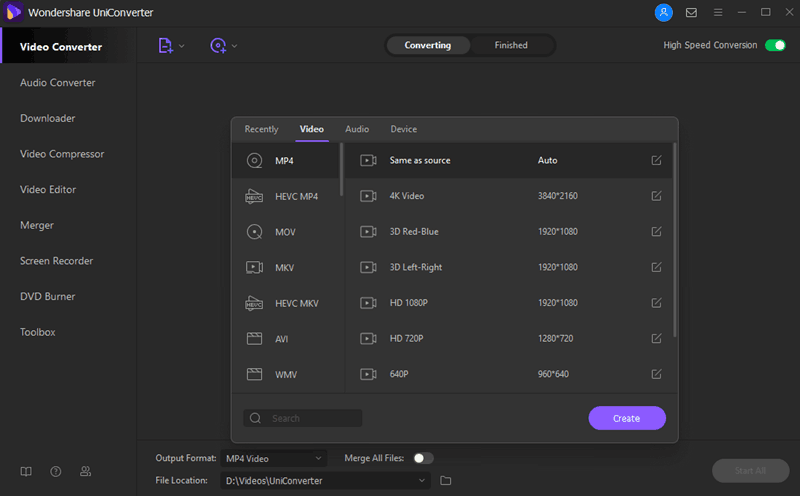 Fast, simple and it is usable for many different file types, including 4K UHD MKV, MTS/M2TS videos. No difficult manuals, no more time spending on FAQ, just selecting the correct file, choose the output I wanted and the program did the work the way I wanted it. Superb! With this software, it was possible for me to store even my oldest movies I’ve once made on an old phone, in the cloud next to my other pictures. And below is my review for Wondershare Video Converter Ultimate and you can follow the below buttons to have a free trial of it for both your Windows PCs and Apple MacBook Pro, iMac etc. How does Wondershare Video Converter Ultimate work? Quit easily. All the icons in the software will lead you through the process. Add one or more video files to start and choose the output you need. The default presets are well pre-programmed. Perfect for the job. If you want you can even change these presets for higher quality or bitrate, change resolution and if you want to add subtitles, no problem! With Wondershare Video Converter Ultimate, you are able to convert almost all video formats including MTS/M2TS, AVCHD, MKV, MP4, AVI, WMV, flash SWF etc and even the Sony MMV. And you are able to convert those video formats to whatever video format or devices including Apple iPhone/iPad/Apple TV, Samsung, Sony, HTC and other Android devices like Innotab and be a perfect alternative to Freemake Video Converter. Besides, Wondershare Video Converter Ultimate is also able to optimize all your videos for web and faster streaming, especially for YouTube, Facebook, Vimeo. Check this guide for details. In the Convert tab, you see it is able to load DVDs. Yes! Wondershare Video Converter Ultimate, though named as a video converting program, supports DVD ripping as well. And the output format is the same as we do in converting like ripping DVD to Apple ProRes 422. 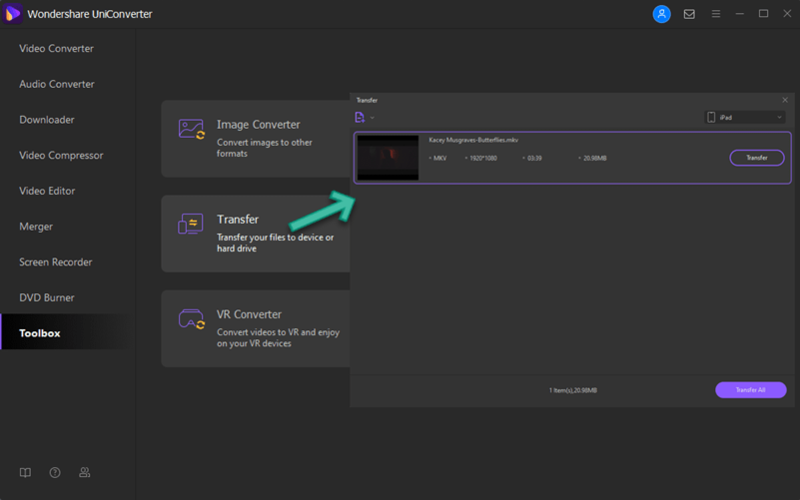 Also, Wondershare Video Converter Ultimate is one of the top DVD rippers that is able to rip DVDs WITH chapters, meaning you are able to switch between different chapters in MP4, MKV etc. But the option is hidden and disabled by default. Please go Preference-Convert to enable. If you have trouble loading and ripping DVDs with Wondershare, check this guide for help. Besides, please note, Wondershare does not support Bluray ripping! Check here to find a good alternative for ripping Bluray discs! Wondershare Video Converter Ultimate works as an iOS and Android manager and iTunes alternative. You can connect your iOS and Android device and transfer the converted videos or ripped DVDs to your iPhone/iPad or Android phone/tablet. Please make sure you choose the profiles for iOS devices before you transfer videos to them as there are limitations on video playback by Apple. And I have successfully transferred my DVD file to my Galaxy S9. Also, after converting the files it is possible to transfer all files into your iCloud Photo library. Just select the files in Finder and copy them to your photo library. Now it is possible to place them in shared albums. Now everyone you want can watch them on their iPad and Apple TV. And after all, the quality is still the same or even better, after optimizing for the correct device (iPod, iPad etc.). Of course, all new file formats are also working great. No hick-ups, fast and clear quality for audio and video. Also during converting the bigger movies, I did notice Wondershare Converter Ultimate was faster than many free programs. For me, this was the opportunity to convert some movies to a view-able iPad format for my two kids on our vacation. And afterward, they still use them, streaming to their Apple TV’s without any problems on WiFi and really good and sharp images on the screen. The program utilizes the hardware GPU in my Intel processor. My MacBook Pro is over 4 years old now, and re-encoding my EyeTV recordings was not only taking a huge amount of time but consuming 100% of my processor during the transcoding. I even have one of there hardware encoders, the elgato turbo.264 HD device. It was severely lacking in its capabilities and didn’t do a lot to speed up encoding, and that is with an external hardware device. Now, I can easily tap the built-in potential of my MacBook Pro with its Intel HD Graphics and get more out of it than I ever did. It gives extra life to an older system and an old workflow that completely hogged the resources and time of my computer. 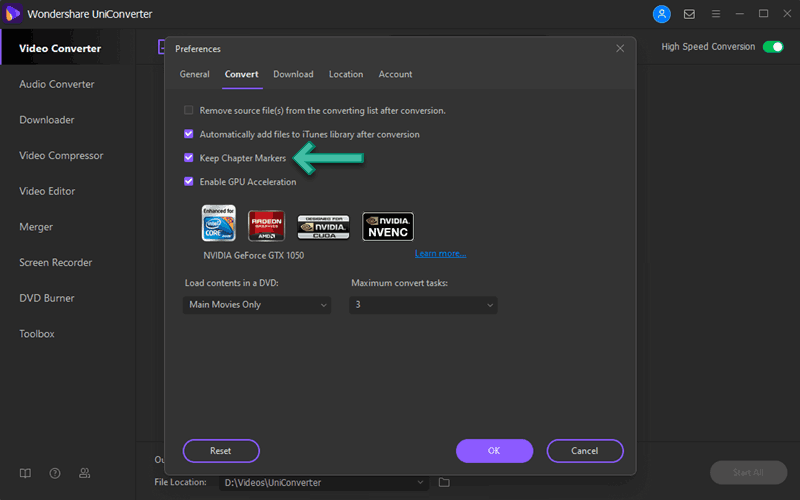 Wondershare Video Converter Ultimate has really freed up my processor and my time to be better utilized for other things that I want to do. 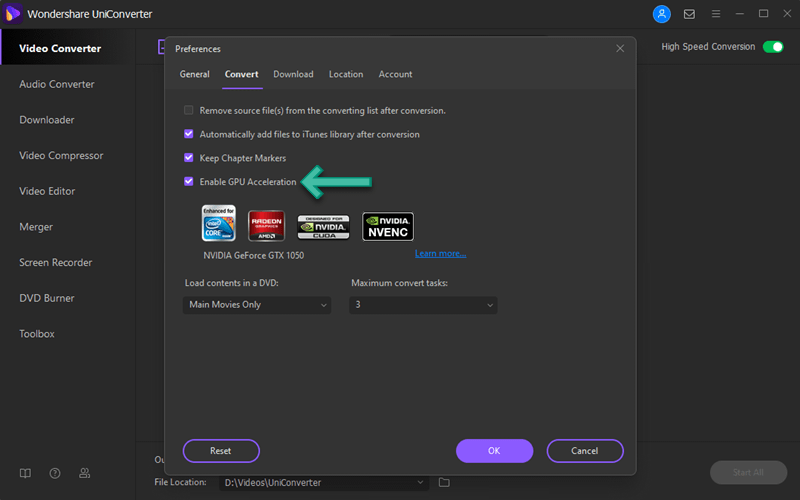 It also supports AMD, CUDA, and NVENC GPU acceleration but you have to enable it in Preference-Convert as well. However, I don’t see those option in the Mac version. I contacted the Support Team and they said to enable GPU acceleration, we have to enable High-Speed Conversion mode. Well, to be honest, I doubt. Wondershare Video Converter Ultimate says it is able to download online videos over 1,000 video sites, and I do believe so. I am able to download FIFA World Cup 2018 videos from YouTube, Facebook, Vimeo, Dailymotion, BBC, etc as well as record live streaming of Russia World Cup from ITV, SlingTV, NBC, Fox etc. It makes really enjoy the World Cup! Wondershare Video Converter Ultimate offers a couple of very useful tools in Toolbox. You are able to add/fix metadata for your media files, so you are able to rip DVDs to iTunes with cover art. Making GIF and VR videos are nice to go for 2018 World Cup videos. You are also able to cast videos to TV and record screen. Copying DVD to ISO or VIDEO_TS folder is an unique feature on macOS. For batch jobs, I would like the option to automatically either delete the original and Wondershare does so! It might be nice to have a PAUSE button instead of canceling the whole ripping/converting. I believe everything I used is just a small part of all the many options Wondershare converter can provide. Do you want to burn DVDs or download YouTube videos, also possible? The program works for itself. I can recommend this software to anyone who needs to convert any movie files for any purpose.